As firefighters tried to contain two wildfires near an ammunition factory in southern Bosnia on Thursday, one of the blazes began setting off explosions in a minefield left over from the country’s war in the 1990s, officials said. No one was injured, but the risks of entering the minefield and heavy winds were making it difficult for the firefighters and several military helicopters assisting them to battle the two blazes in the populated area. Both fires were threatening the Igman ammunition factory on the outskirts of Konjic village from opposite sides, with one of them burning in the heavily mined forest. “We are doing our best but with the heat and the wind the fires are spreading fast and there is not much we can do about it. It’s all in the minefields,” said Fadil Tatar, commander of Konjic civil protection. Tatar, who is in charge of coordinating the rescue services and firefighters, said several explosions could be heard Thursday morning as the fire set off some of the mines. Hans Nijkamp, the head of Shell‘s operations in Iraq, has highlighted the success in removing explosive remnants of war (ERW) at the Majnoon oilfield, in which Shell has a 45% stake. Speaking at CWC‘s Iraq Petroleum 2012 conference in London last week, Nijkamp said that more than 12 million square metres had been cleared so far, and work was proceeding at a rate of around 70,000 m2 per day. Over 250 staff from 4 different contractors were involved in the operation, and well over 13,000 items have been removed and disposed of through controlled demolition by the Iraqi Army. The largest single item was a 500 kg explosive. Shell’s other partners in the Majnoon venture are Petronas (30% share) and the Missan Oil Company, representing the Iraqi State (25% share). Landmines planted by al-Qaida militants before they fled key southern Yemen strongholds have killed 73 civilians over the past week, Yemeni officials said Tuesday. Engineering teams have removed some 3,000 land mines around Zinjibar and Jaar, according to the governor’s office in Abyan province. Government troops captured both towns in a two-month offensive to uproot al-Qaida fighters from large swaths of land they captured during last year’s political turmoil. Mines left behind killed 73 residents, the officials said. BEIRUT: Syrian forces crossed 300 meters into Lebanon Wednesday and planted land mines along the eastern border area of Masharih al-Qaa, a security source told The Daily Star. The source added that Syrian troops also planted mines around the house of Lebanese citizen Mohammad Aqeel. The operation lasted 30 minutes. Working in the fields isn’t typically considered a dangerous job. But with plantations still littered with unexploded ordnance, some Cambodians are looking for companies to step up. Frustration grips Von Tha’s face as she fumbles with a hand that no longer works. Ron Run says that seeing his wife’s physical and mental struggle has, for him, been one of the hardest parts of the family’s ordeal. Two months since the explosion at a cassava plantation in Kratie, and the group of five are still feeling its effects. It’s a case that underscores the danger for workers at contaminated sites. In Cambodia, companies and landowners can choose whether or not to clear areas used for commercial purposes such as agriculture, mining or ecotourism. 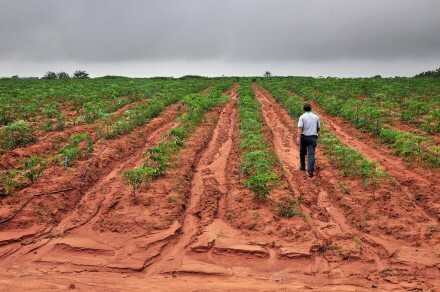 With improved access to previously difficult to reach areas comes increased economic interest in utilising the land. 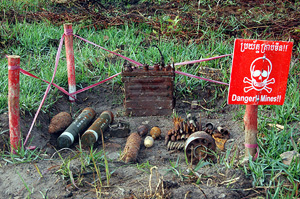 Accidents on land used for enterprise illustrate the importance of ensuring known-risk areas are cleared of explosive remnants of war (ERW) before workers can enter the site and start tilling the soil. The Trans Federal Government in Somalia has decided to join the Mine Ban Treaty of the United Nations. The mine action unit within the Danish Refugee Council recognizes and supports the development. Somalia is one of the regions in Africa most contaminated by mines. As the last African country to officially ban use of landmines, Somalia has now agreed to destroy all stockpiles no later than 1 October 2016 and to clear all contaminated land no later than 1 October 2022. In addition to this, Somalia is obliged to provide assistance to the thousands of mine victims. Somalia has never produced mines, but it is assessed that around 200 communities are contaminated by mines. At least 159 casualties of landmines and explosive remnants of war in Somalia (excluding Somaliland) where recorded in 2010, including 19 children killed and 86 children injured. The true casualty figure is likely to be much higher. The Jordan Armed Forces on Wednesday said Israeli troops will work on removing anti-tank mines in the land opposite Al Rabei area in Deir Alla in Balqa Governorate on Thursday. The mine clearance will be carried out from 8:00am to 7:00pm, according to a source from the JAF, who noted that Jordan has requested that Israelis abide by the amounts of explosives previously agreed on during demining operations. NIAMEY, Niger (AP) — Regional authorities say a vehicle carrying West African migrants toward Libya struck an anti-tank mine in Niger, killing seven people. Gov. Garba Makibou of Agadez in northern Niger says five people were injured in the accident that happened over the weekend when the vehicle veered off the road to avoid a routine check about 17 kilometers (10 miles) from Dao Timi, the last Niger military post before the Libyan border. He says the injured were evacuated to Agadez for treatment. Makibou also announced that a weapons cache containing 53 missiles was discovered by people in the same region. He didn’t give further details. Since the fall of Moammar Gadhafi arms have been circulating in Niger near its northern border with Libya. Kisangani — Years after the Great War of Africa ended, remnants of war are still scattered throughout the Democratic Republic of the Congo in the aftermath of one of the deadliest conflicts worldwide since World War II. In an effort to help the DRC reduce the number of land mines and unexploded ordnance, four soldiers from the 184th Ordnance Battalion (EOD), out of Fort Campbell, Kentucky provided a train-the-trainer course with 11 Forces Armees de la Republique Democratique du Congo (FARDC) deminers to improve their explosive ordnance disposal (EOD) skills. This engagement, which is part of the Humanitarian Mine Action program, took place April 6 through 27, 2012 at Camp Base in Kisangani, the capitol of the Orientale Province in the DRC. The main objective of this exercise was to improve the FARDC deminers’ EOD skill sets to a point where they can set up a sustainable program in the DRC and to improve relations between the DRC and the United States, said Captain Charles A. Schnake, the exercise officer in charge. “The HMA mission gives EOD technicians a chance to share lessons-learned with our allies and to sustain amiable relations. It’s also an opportunity for U.S. soldiers to experience a once in a lifetime mission to work in new environments. It was important to me because it gave me the chance to make a lasting impact in the sustainability of life-saving skill sets with our partners overseas,” Schnake, a Honolulu, Hawaii native said. The first three days of the engagement focused on assessing the level of proficiency for the FARDC deminers. After their progress was evaluated, the Congolese soldiers were taught ordnance identification, explosives safety and theory, metal detector operations and demolitions. Staff Sergeant Robert L. Hayslett, the head instructor and noncommissioned officer in charge of the mission, said he enjoyed seeing the DRC military eager to learn, broaden their skill set and accomplish the mission. “The United States has the resources and the personnel with the experience available to teach these critical skills to these soldiers, it’s nice to see the U.S. has a vested interest in the area. My favorite part was the interaction with the foreign students, getting to interact with a foreign military. This event is an opportunity that not a lot of soldiers have, and we can now take these partnering experiences back and use them abroad,” Hayslett, a Newville, Pa. native said. During the 21-day program of instruction, both sides were able to take away important lessons from the experience. 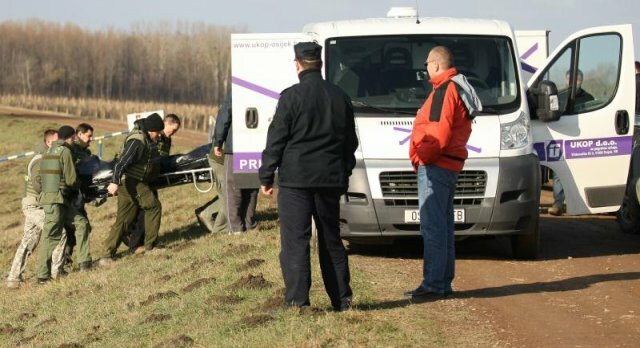 49 year-old EOD specialist from Croatian mine clearance company Mungos was killed today while performing his duties in Darđanska forest near Osijek, Croatia’s 4th largest city. An estimated 1500 landmines remain in the forests by Drava river, and mine clearance specialists arrived in December 2011 to start clearing them out. Due to forested terrain, remote controlled demining vehicles couldn’t be used. EOD personnel commented that the mines were lain without a particular plan, making it more difficult to locate particular fields. 754.5 square kilometers of Croatia are still covered with mines, down from over 4500 square kilometers immediately after the war. A total of 1.5-2 million land mines, were deployed by Serb forces during the Homeland War. A total of 8% of Croatian territory was mined at the end of the war. Some 1500 people suffered injuries from mine blasts and around 440 were killed by 2011. BEIRUT: The corpses of five Syrian army soldiers buried during the 1982 Israeli invasion of south Lebanon have been discovered by a demining team, security sources told The Daily Star. 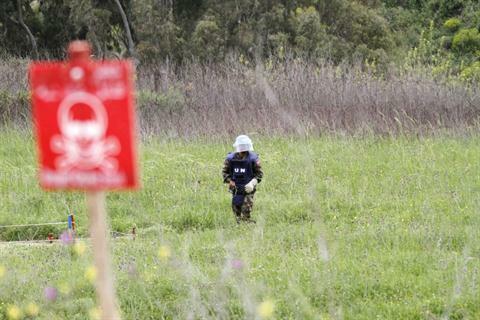 Members of the demining team MAX, whose work involves clearing areas of cluster bombs, discovered the bodies in a plot of land near the Jezzine-Kfar Houneh main road in south Lebanon. 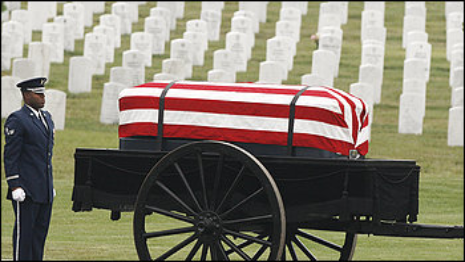 The bodies, security sources said, were buried in 1982, during the second invasion of south Lebanon by the Jewish state. The soldiers are believed to have split off from their contingent, which at the time had been stationed in the area, as a result of Israeli aerial raids.